I woke up this morning for a yen for cookies. I have a bag of Easter candy in the corner of my office that keeps calling my name and I decided that I should do something with the candy before it all ended up in my stomach. At least with these Snickers Peanut Butter Cookies, I can’t say that 3 or 4 won’t hurt that much! 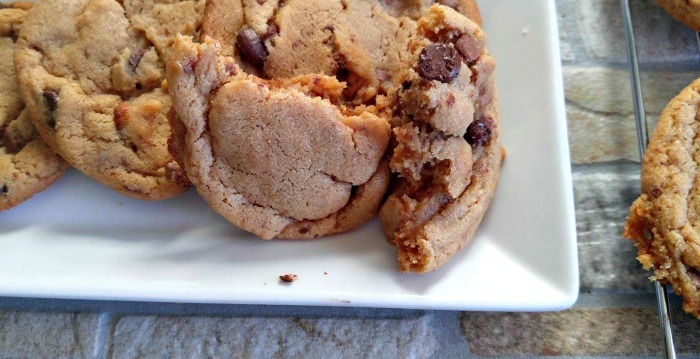 June 12 is National Peanut Butter Cookie Day. Time to celebrate with the perfect recipe. 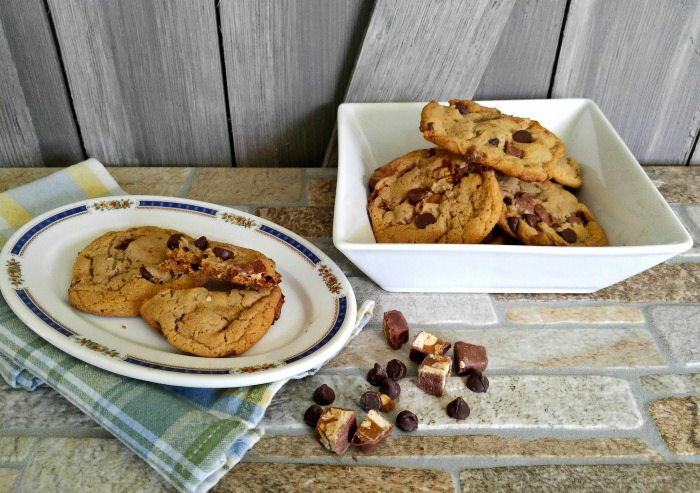 If you love making 30 minute meals and quick desserts, you’ll love these cookies. They make a super ending to an easy meal and are great for an afternoon snack. I am very fond of anything with peanut butter in it. My husband likes it okay but it’s not his first choice for a dessert ingredient. 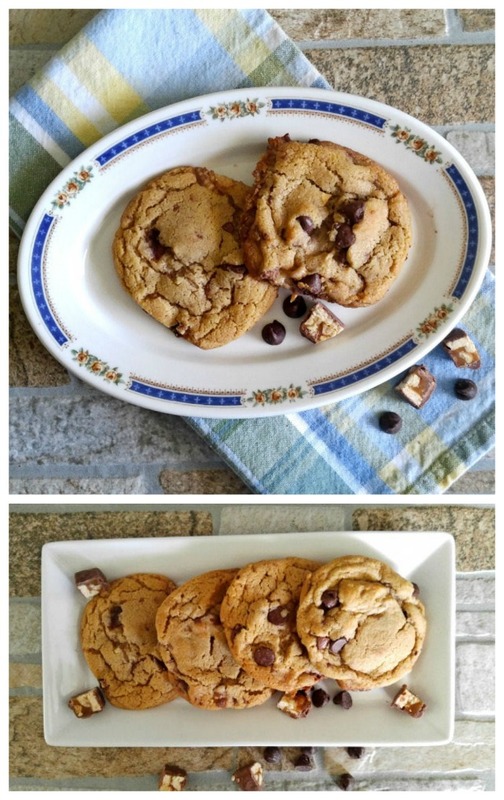 These amazing cookies are a good compromise. The Snickers’ chopped up candy bars adds a nice chewy caramel texture and taste that sort of tones down the peanut butter. The combination is really very nice. Time to make some Snickers Peanut Butter Cookies! The dough comes together easily. I just whisked my flour and other dry goods, being careful to measure the flour correctly to make sure that the cookies are not too dense. Then I used my stand mixer to make the dough. After that, all my sweet goodies get dumped in and combined to make the perfect cookie dough. Now my only problem is that the cookie dough is calling my name instead of the bag of candy in the corner of my office! Look at this amazing concoction! I made 36 cookies. I just made the dough into balls and placed it on silicone baking mats on cookie sheets. The cookies cooked beautifully and clean up was a breeze. I love using the mats instead of parchment paper since you can reuse them over and over again. Onto a wire rack for a few minutes to cool. They look scrumptious! I can’t wait to try one. And now for the taste test! The cookies are so tasty. I love that they have the hint of peanut butter as a base and the lovely sweetness of nuts and caramel from the Snickers. I’ve never made cookies with candy before and I now I know what to do with the rest of the candy. The work beautifully in cookie dough! 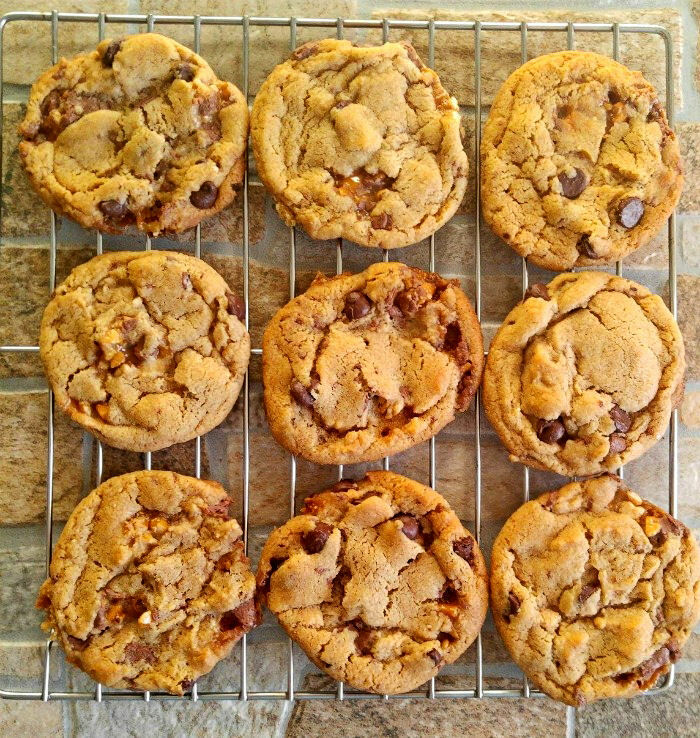 One bite (or three) tells me that my husband is going to love these amazing Snickers Peanut Butter Cookies. He just called me to talk about my day, and I told him I had made 36 cookies for him. His first question was “how many did you eat?” LOL…he knows me well! 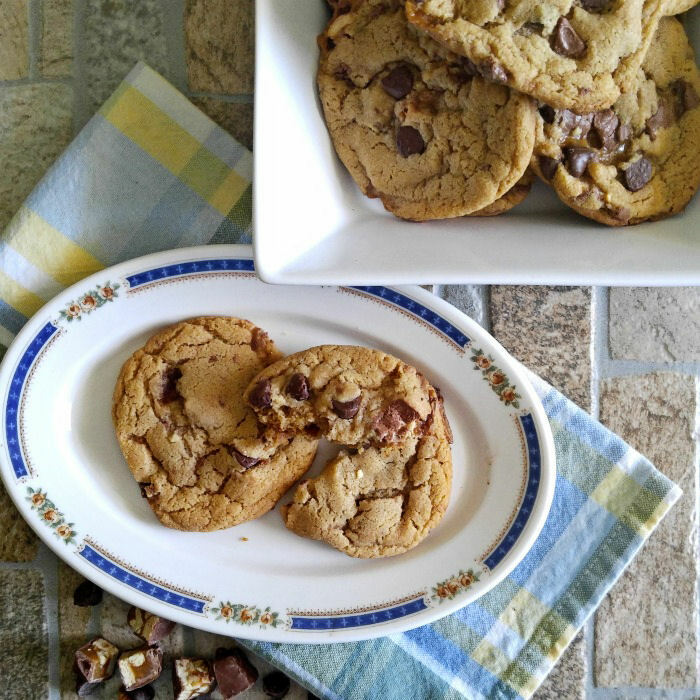 Have you ever made cookies with candy? What combination worked for you? Preheat your oven to 350 º F. Line two baking sheets with silicone baking mats and set aside. Place the flour, baking soda, baking powder and sea salt In a medium bowl and whisk together until well combined. Set aside. 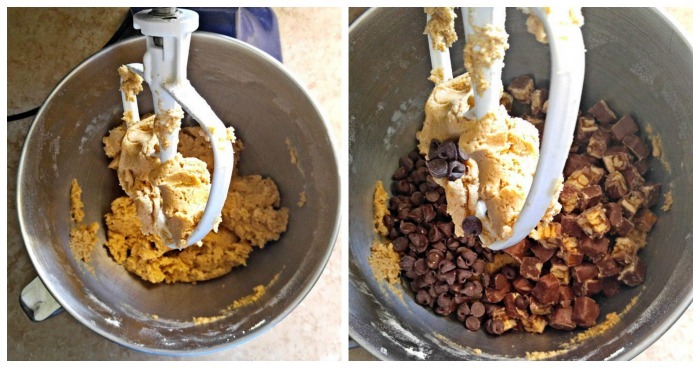 In the bowl of a stand mixer, cream the butter and the peanut butter together until the mixture is fluffy. Mix in the granulated sugar and brown sugar and beat until smooth. Add the egg and mix until combined. Blend in the milk and the pure vanilla extract and mix until everything is well blended. Gradually dd the flour mixture a half cup at a time and beat until well combined. 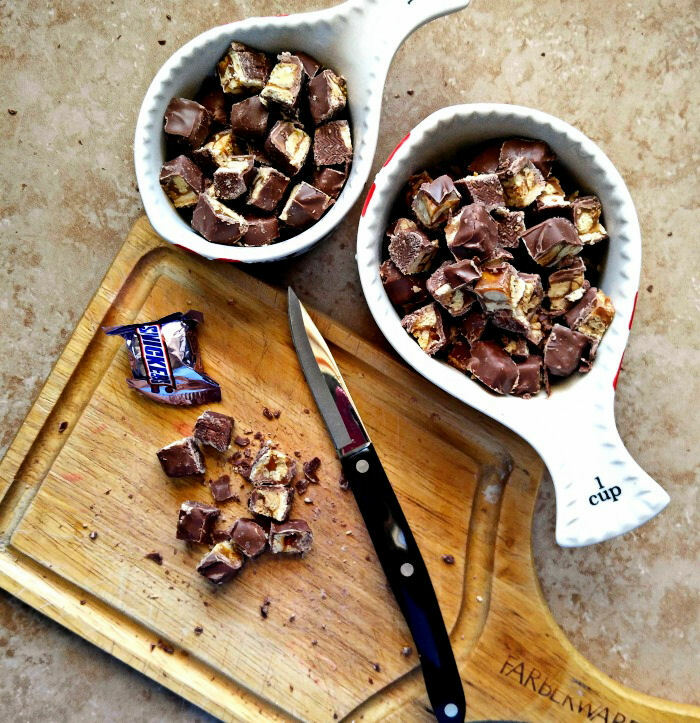 Stir in the chopped Snickers and dark chocolate chips. Drop by rounded tablespoons onto the prepared baking sheets. 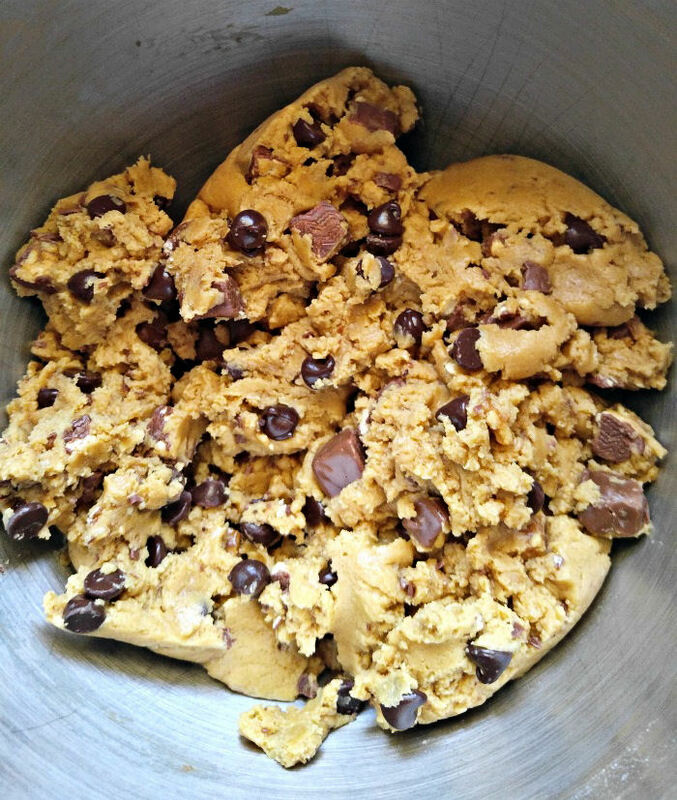 Gently flatten each cookie ball and bake for 10-11 minutes, or until cookies are slightly brown on the edges. Cool the cookies on the baking sheets for about 5 minutes, then remove to a rack to cool completely.